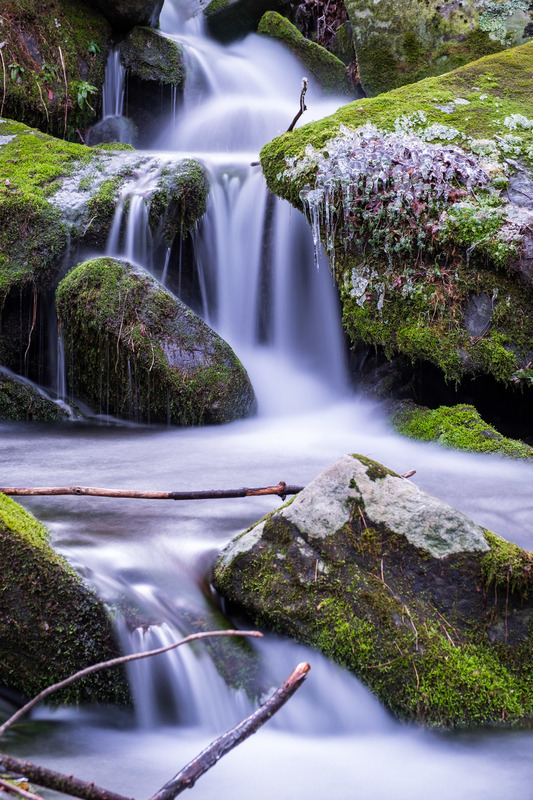 We happened upon the most beautiful brooks along Newfound Gap Road... this one's for all of you frothy water lovers out there! 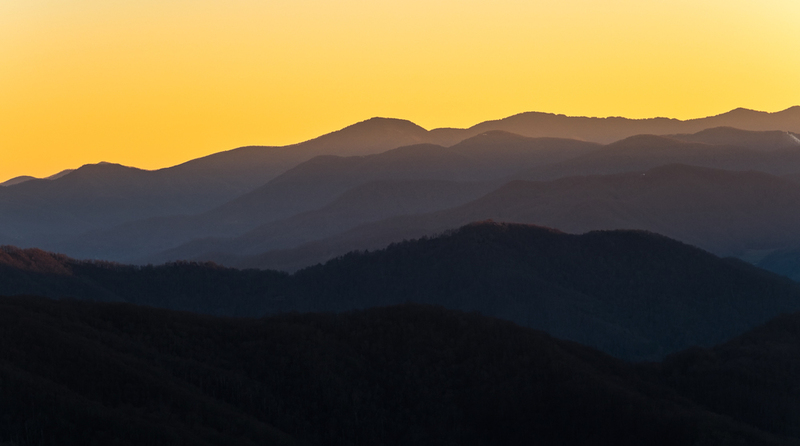 It's easy to see why the Great Smoky Mountains are the most visited National Park of them all. 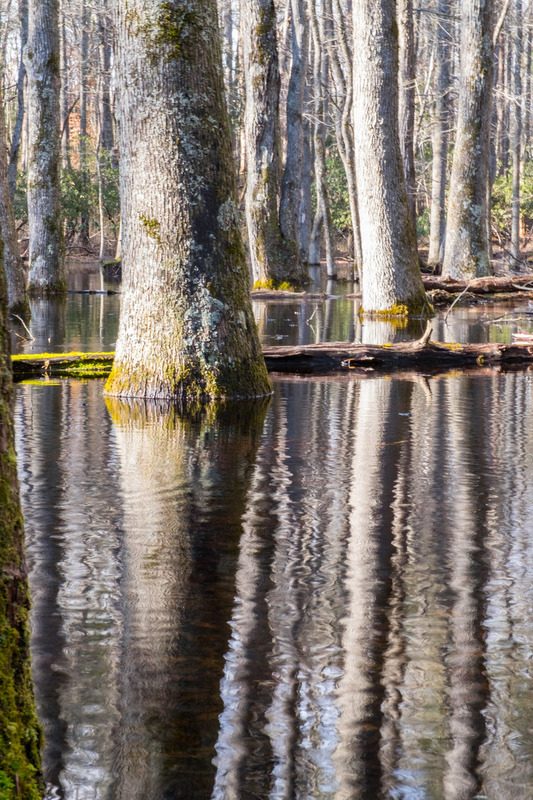 The park is located in a crossroads of sorts through the American southeast, straddling the Tennessee and North Carolina state line. 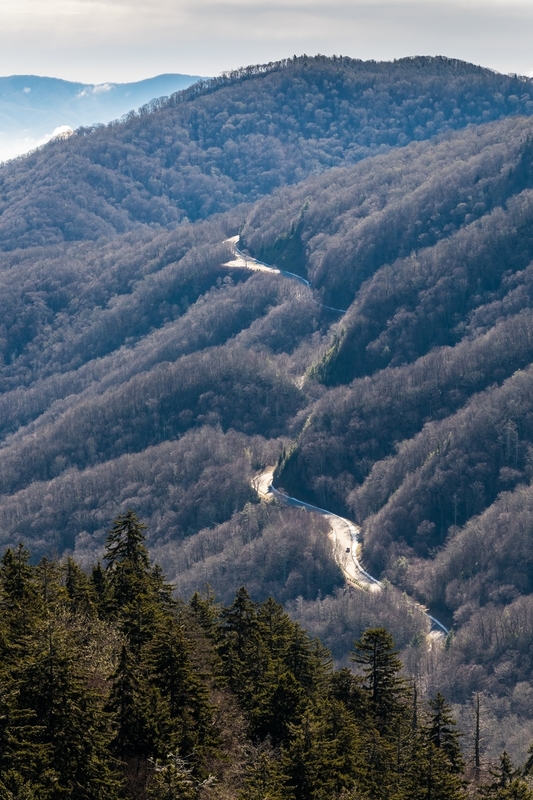 Winding through the heart of it is one of America’s most famed and prized scenic byways, the Blue Ridge Parkway. 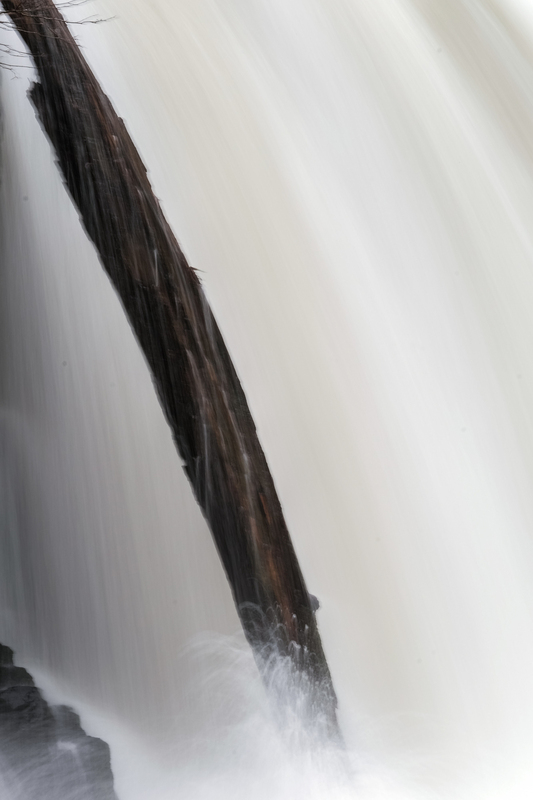 Rivers in the area draw rafters and kayakers from all over the country and world to learn, practice, and play in the whitewater. 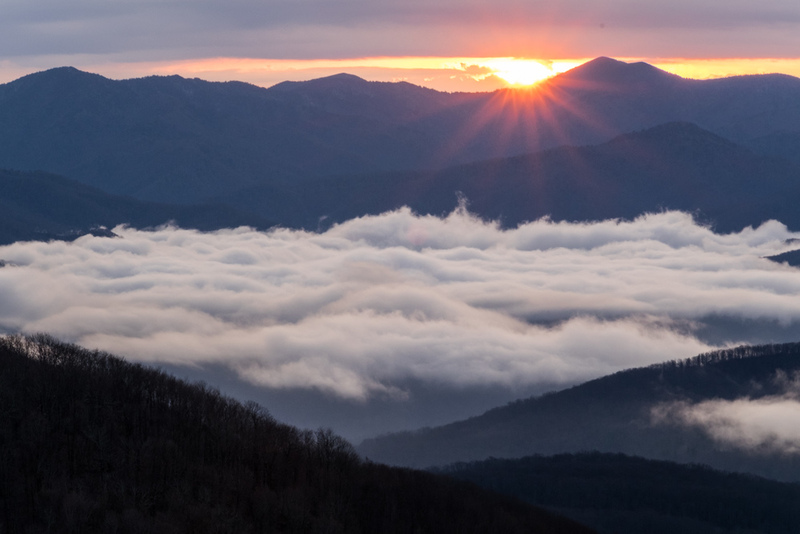 Long distance trekkers cross through 71 miles of mountains in the Great Smokies while journeying the epic Appalachian Trail. The Cherokee Indian reservation on the south end of the Park tells the story of the area's Indian heritage. 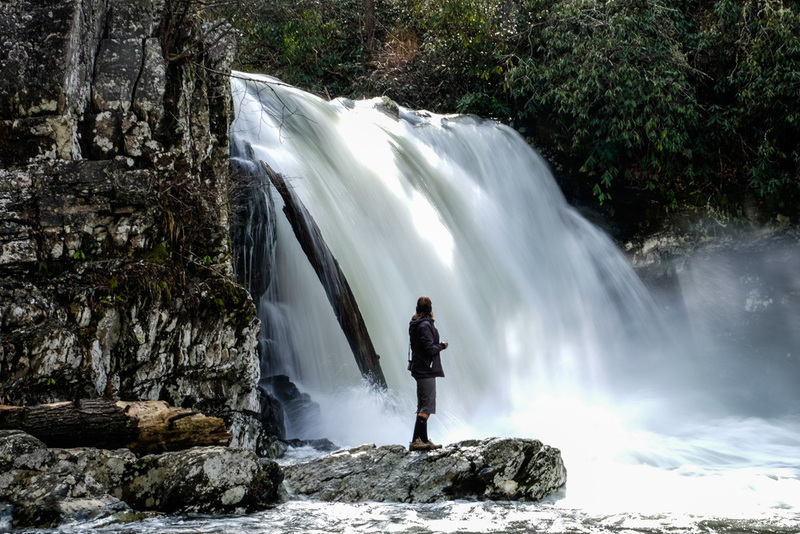 For art, food, and other city-centric activities, the super-cool hipster community of the south, Asheville, North Carolina, is just down the street. And above all, this park is very beautiful. 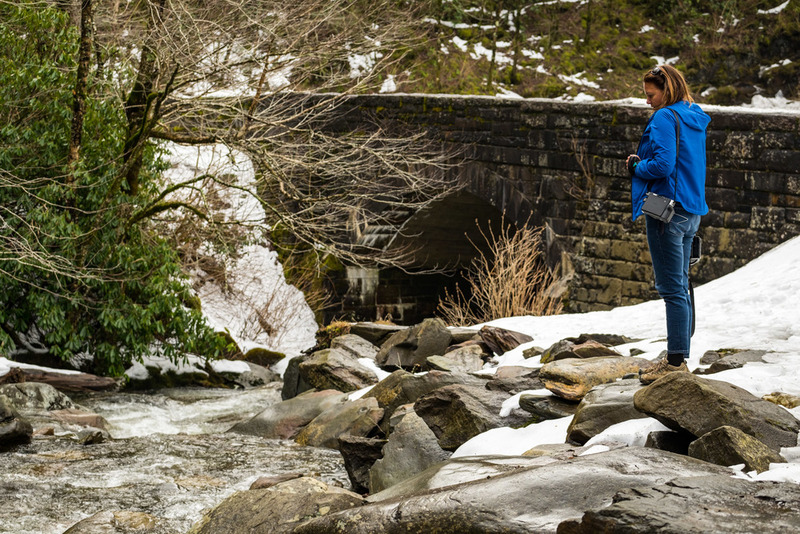 It is for all of those good reasons and many others that visitors flock to the Great Smoky Mountains—but not during the winter. We seemed to have the park all to ourselves. With closed-for-the-season activities around every bend, it's clear we missed many of the draws that bring people back here, year after year. 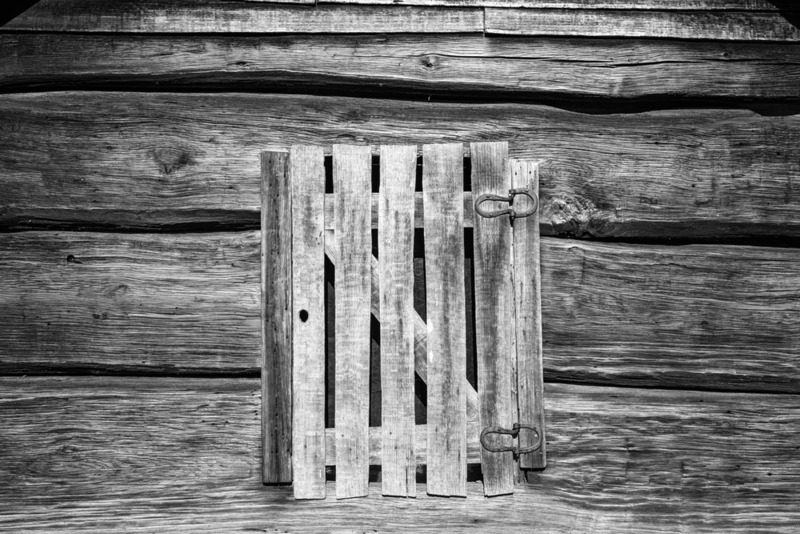 That is not by any means a complaint, we were blessed by so much that isn’t available when the hoards are in town. 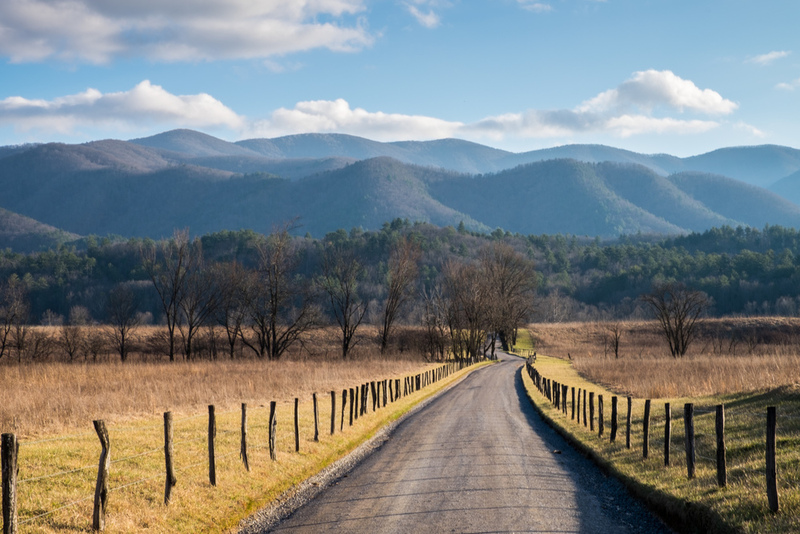 Take for example our drive through Cades Cove, the most popular attraction in the park—it was long and winding and virtually empty. We were able to stop to watch elk and deer and wild turkey pass through the landscape without disrupting traffic, and without traffic disrupting us. 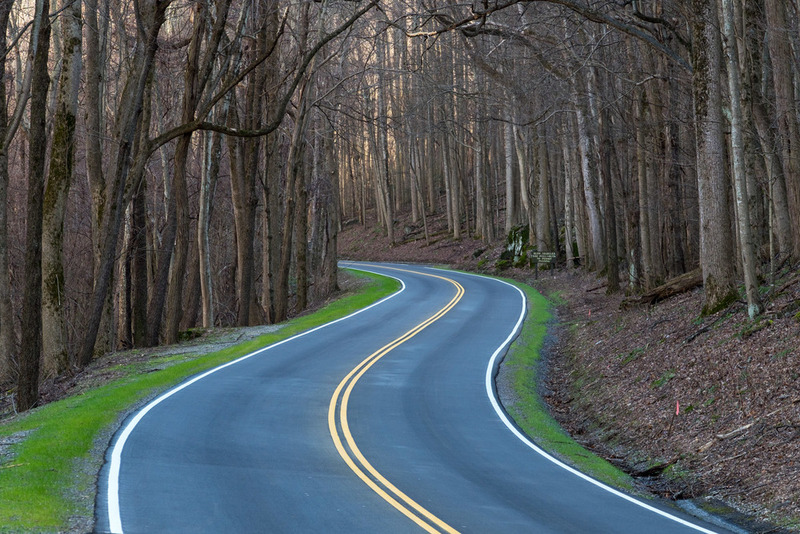 An empty byway through the heart of the Great Smoky Mountains National Park. Unreal. ...but not during off-season! Cades is by far the most popular site in the park. 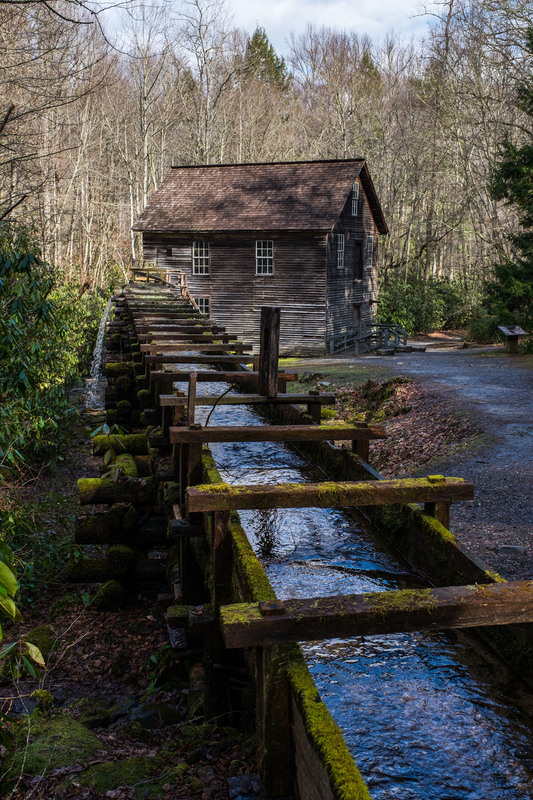 You can meander along the 11-mile driving loop through pastoral landscapes, to historic log cabins and churches, all the while viewing wildlife without ever having to leave the comfort of your car. It’s kind of a driving safari, as is the entire park. 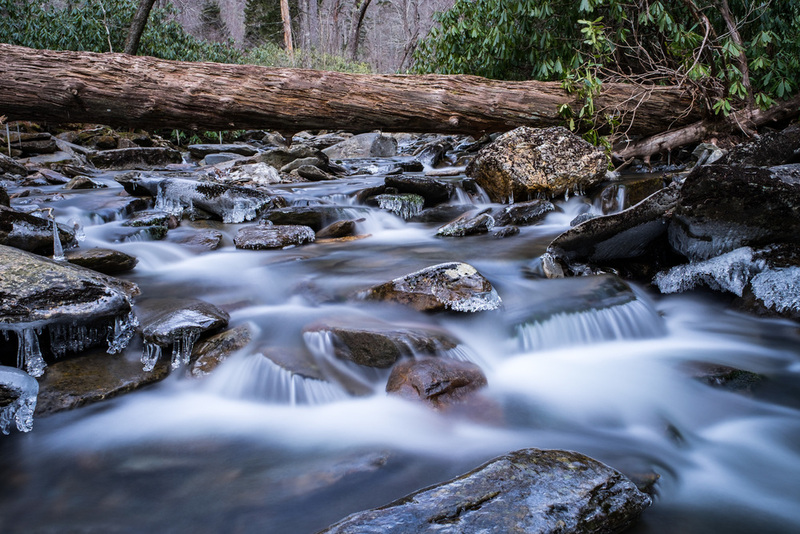 Scenic drives such as the Newfound Gap Road provide a welcome mat to countless brooks, waterfalls, overlooks, and trailheads; along winding roads where we can capture those s-curve-through-nature photographs that we love so much. And during off-season, you can actually capture an unobstructed shot of the road in the most visited U.S. National Park. Unbelievable. 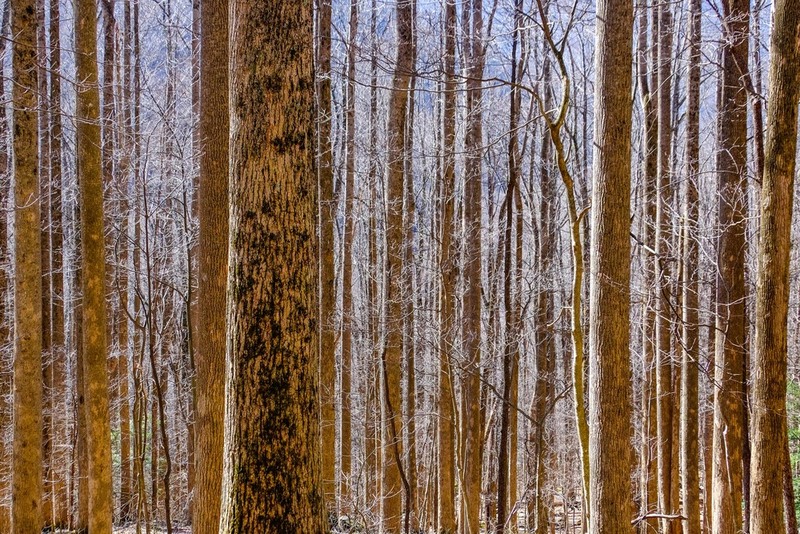 They say there are more trees in the Great Smoky Mountains than in northern Europe. 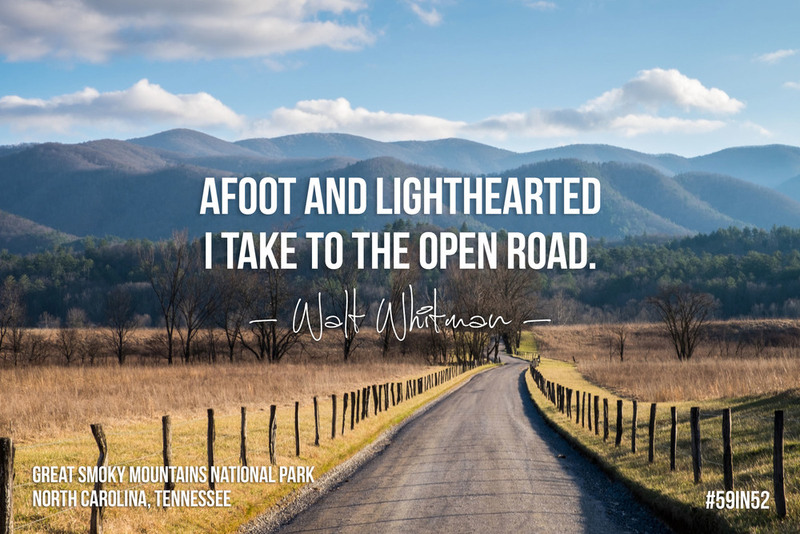 It’s easy to lose an entire day or days exploring by car because there is so much to see just by looking out the window, even surpassing views of wildlife, vistas, valleys, rivers, and roads. 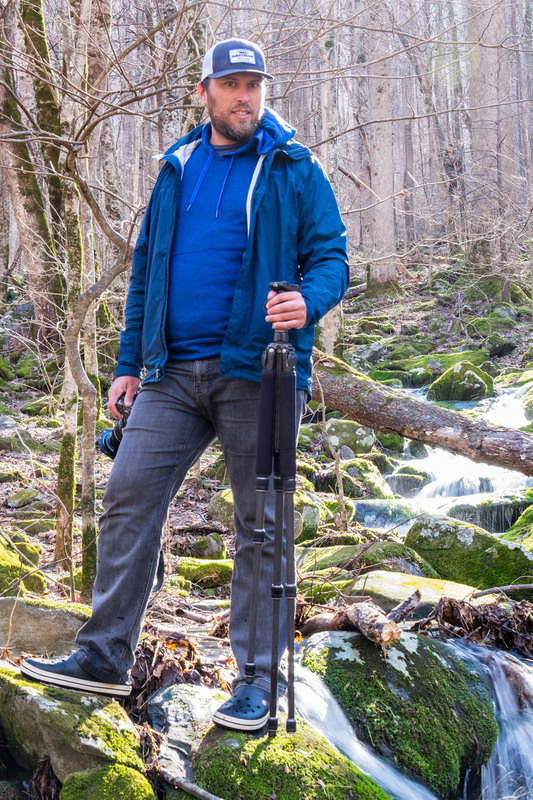 It is when you head out on foot, though, that you really get a sense of the incredible vastness in the Great Smoky Mountains... there seem to be millions and billions and trillions of trees. It’s an odd feeling, being a simple human among millions and billions and trillions of trees. 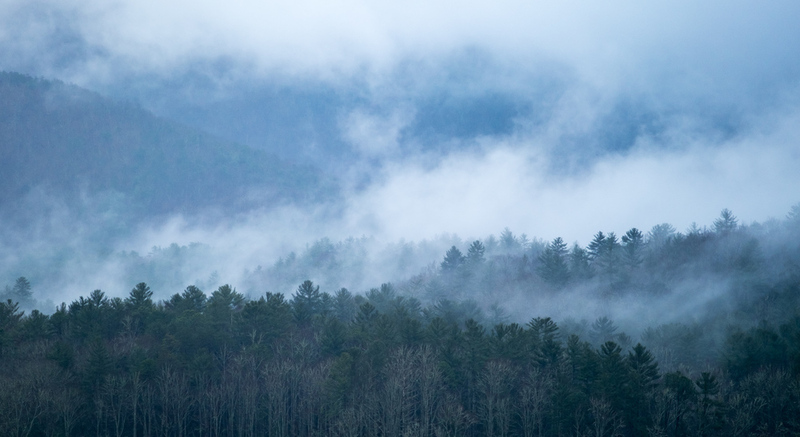 Odd and especially awesome when the blue haze that rests upon the tops of those trees is met by a distinct peacefulness that occurs there during the quiet of off-season. We would have like to have stayed much longer and explored much more, however, other parks await. We're beginning to think of this year's adventure as window shopping for future adventures! 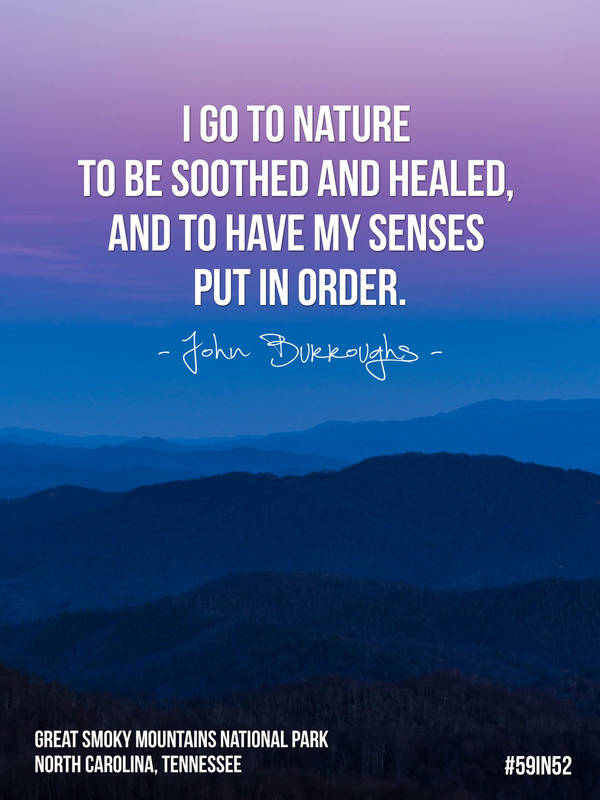 On that note, we want to send a shoutout with much gratitude to the National Park Service, for preserving these places for us to return to in the future. 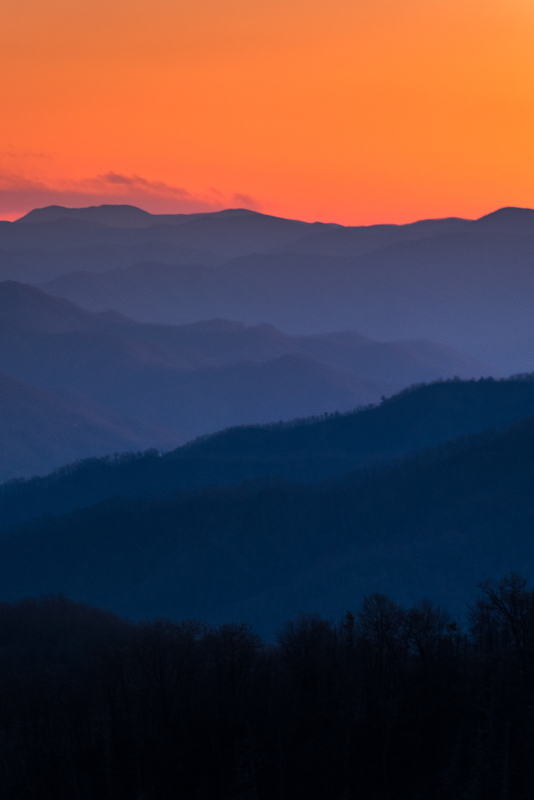 Location: Eastern Tennessee and western North Carolina in the Blue Ridge Mountains, a subsection of the Appalachian Mountains. 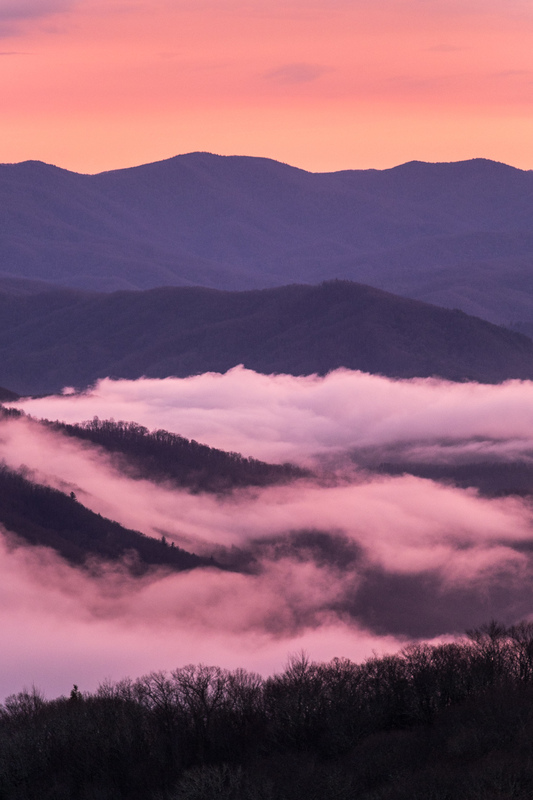 How the park got its name: The Great Smoky Mountains got its name from the Cherokee Indians who called the area shaconage (shah-con-ah-jey) meaning "land of the blue smoke," after the thick, bluish haze that hangs over the mountains peaks and valleys. 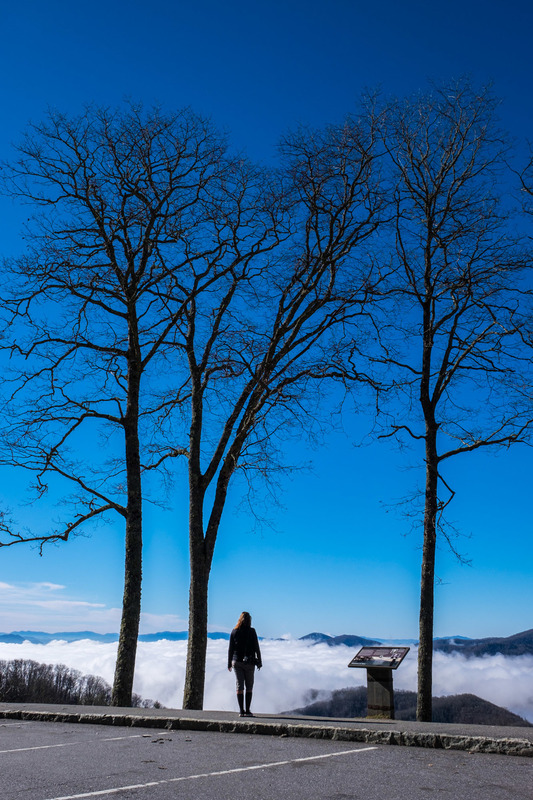 Iconic site in the park: The highest peak in any National Park often becomes iconic, and Clingmans Dome in the Great Smokie’s is no different. 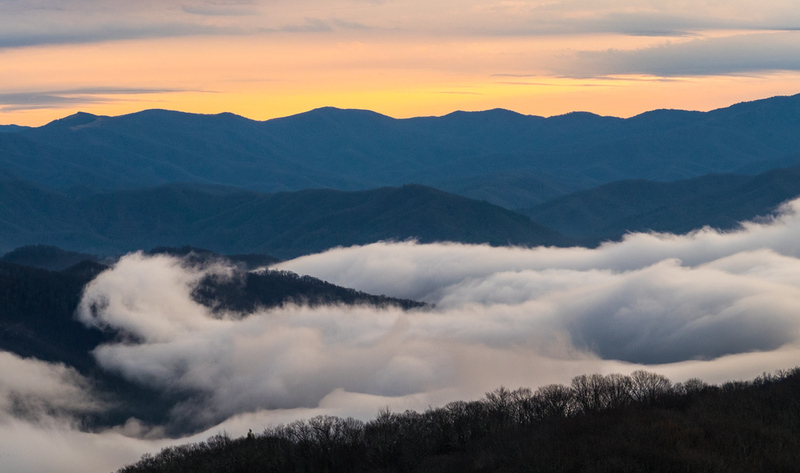 From 6,643 feet, one can see 360° views of the National Park and far beyond on a clear day. 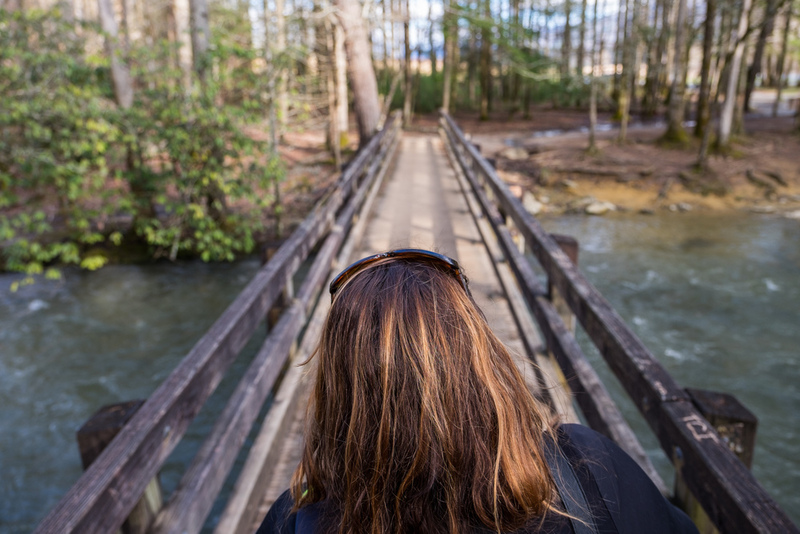 Accessible adventure: Cades Cove is a valley surrounded by a one lane, 11-mile loop road that puts visitors among wildlife, historic buildings, and trails from where you can head off on foot to explore deeper. The driving road is closed Saturday morning until 10am during the spring and summer, allowing access to cyclists and people to wander without traffic. Visiting during off-season, we had the road all to ourselves! 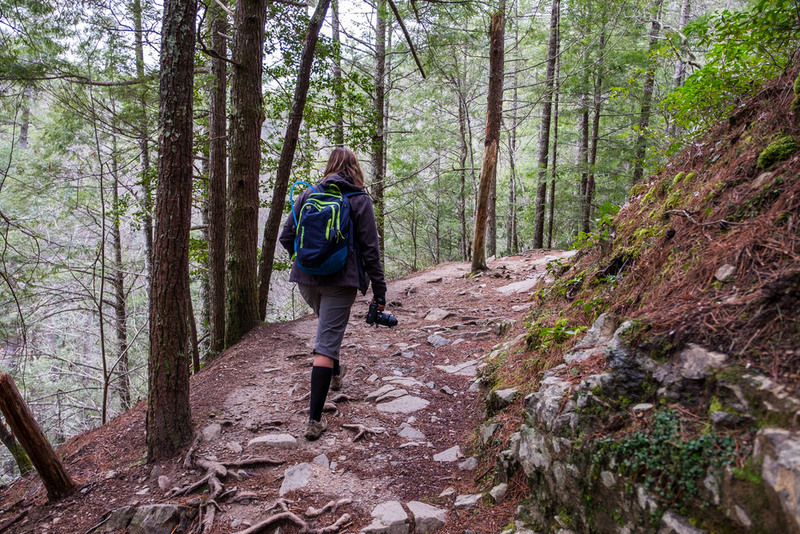 Big adventure: The Appalachian Trail that runs from Maine to Georgia has a 71-mile section in the Smokies, giving hikers a taste of the legendary trail while in the park. 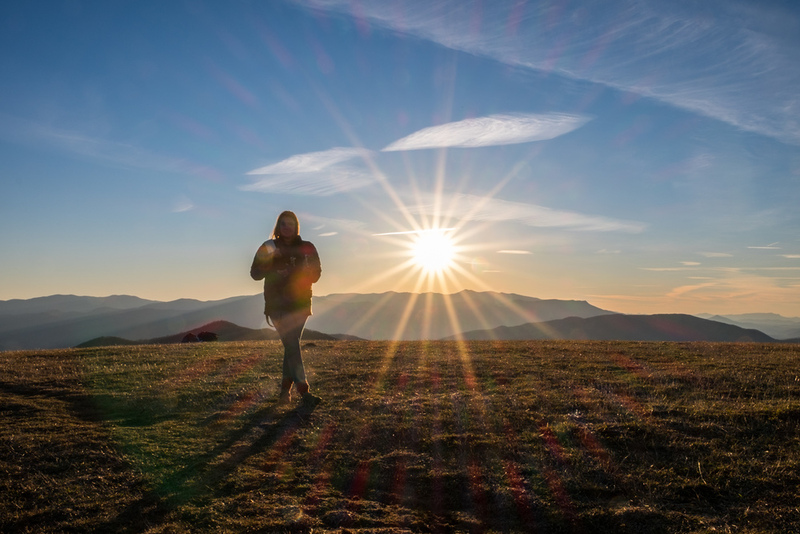 We found our feet planted firmly on it at Max Patch, a bald-peaked mountaintop. 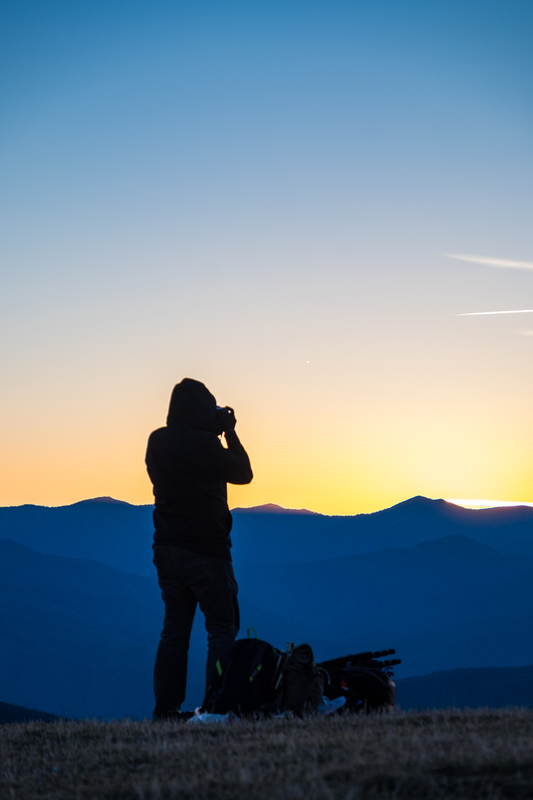 It is located just outside of the Park but it provides views across all of it, making it a favorite place for photographers and skywatchers to catch the sunset and capture the stars. The elk population is strong and growing. Three cheers! Approximately 1,500 black bears live in the park. This equals a population density of approximately two bears per square mile. 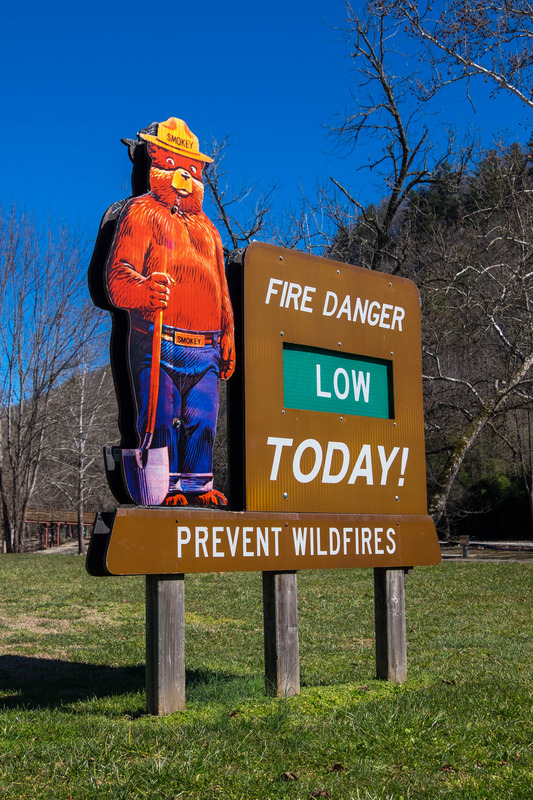 Perhaps this is from where Smoky the Bear got his name...? 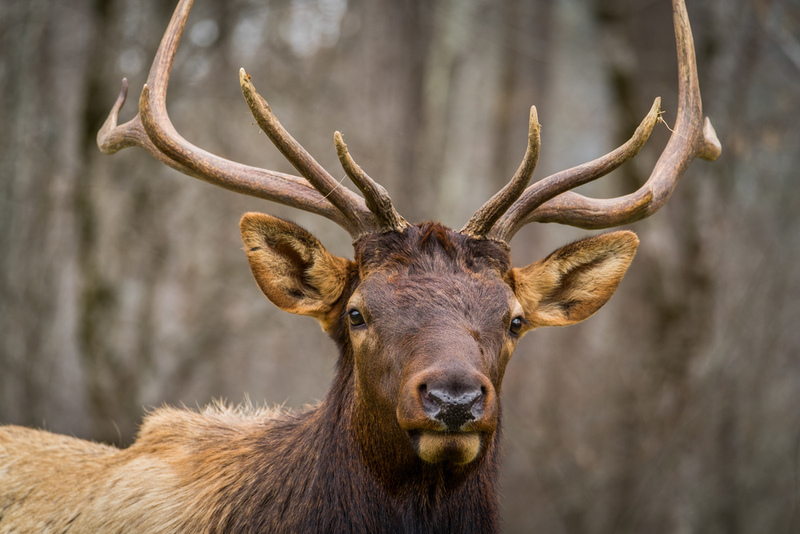 An experimental program to reintroduce elk to the park was begun in 2001. 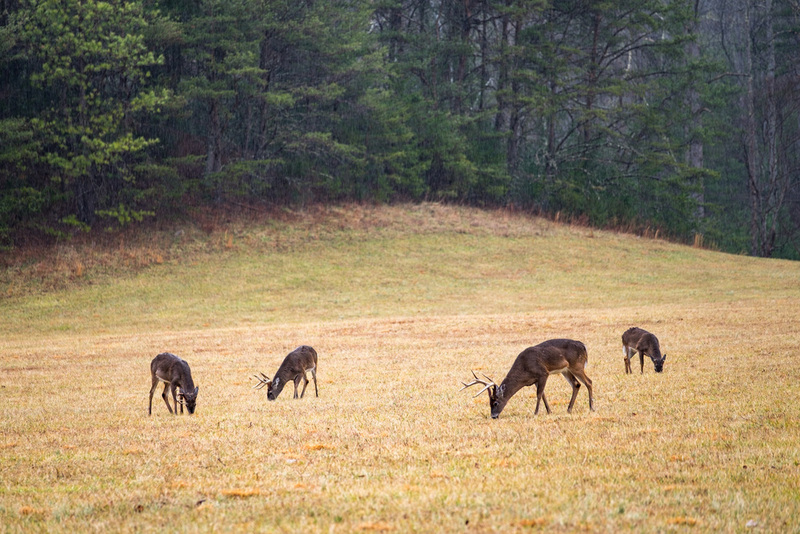 Elk once roamed the Smokies, but were eliminated from the region in the mid 1800s by over-hunting and loss of habitat. Other animals successfully reintroduced to the park include river otters and barn owls. Bird alert! More than 240 species of birds have been found in the park. Sixty species are year-round residents. Nearly 120 species breed in the park, including 52 species from the neo-tropics. Many other species use the park as an important stopover and foraging area during their semiannual migration. 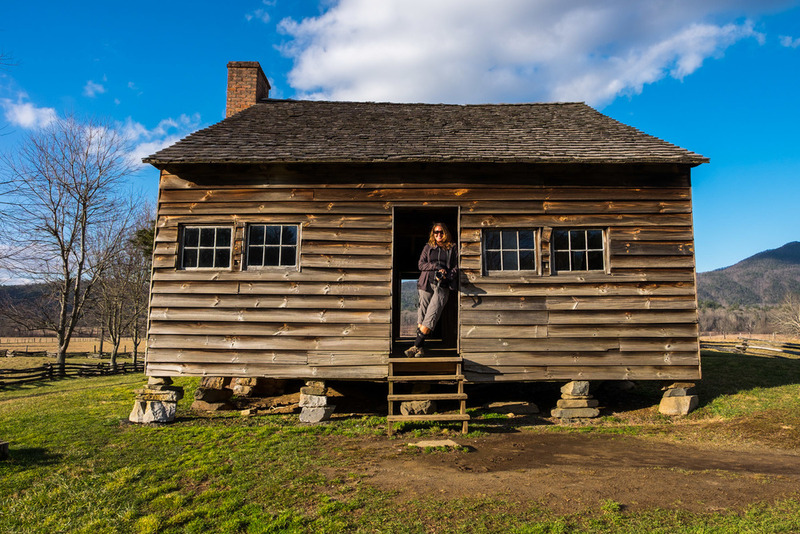 Parts of 1950s TV show Davy Crockett, King of the Wild Frontier was filmed there. 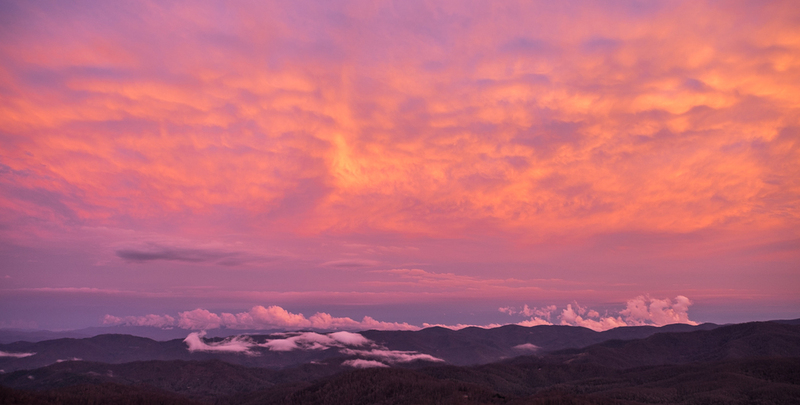 Every year, synchronous fireflies light up the Smokies for about two weeks during their annual mating ritual. They are the only beetles in North America with the ability to flash in sync.